« Our Cookbook “Breakfast at 8” is at the Printers! 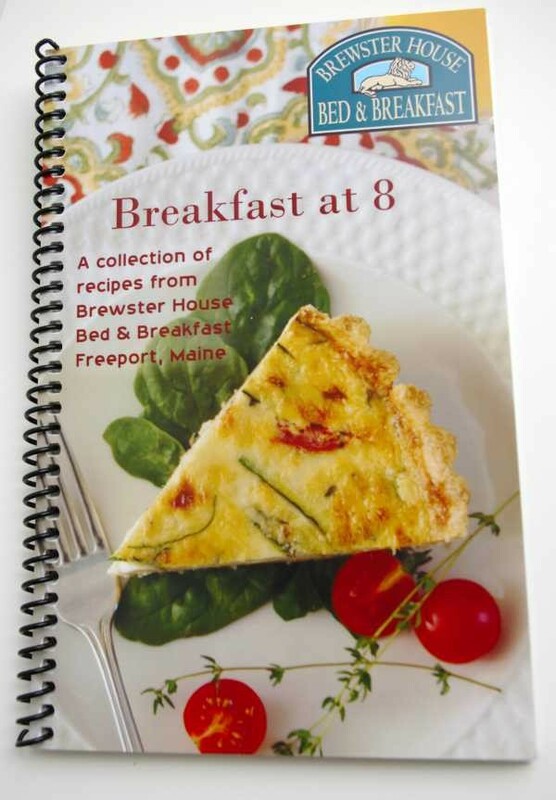 We’ve been writing for a few weeks about the upcoming release of Breakfast at 8, the Brewster House cookbook, and it is now back from the printers, full of bed and breakfast recipes, and is almost ready to go! Whether for a special breakfast (some of our guests like to use these recipes for Christmas morning, or other special occasions), or for just a special breakfast on a quiet weekend, there is something for everyone in Breakfast at 8. In addition to loads of selections of sweet and savory main breakfast dishes, there are plenty of fruit starters (many of which make wonderful desserts in the evening, as well), scones and muffins, cookies, and more! Those who pre-ordered will be receiving their copies as soon as we can get the shipping materials together (we expect to begin shipping by about April 10). New orders will go out as quickly as possible after the pre-orders. If you haven’t ordered your copy, you can use the convenient shopping cart at right (you’ll be taken to a secure area using Google Wallet to put in payment info), or on our website’s gift shop page. We hope these recipes will bring you as much enjoyment (and good taste!) as they have for us! We stayed at your lovely Inn several years ago. It was a cooler fall day when we got back from a drive up north and you had a cranberry/cider warm tea in the parlor. We LOVED the tea and it was so wonderful on that particular rainy afternoon. Would you share with us what that tea might have been? Is it available to purchase or is it one of the wonderful recipes at your Bed and Breakfast? Sorry Frankie, that was a recipe offered by a previous owner that we no longer have access to. We hope to see you again though so you can sample some of our offerings!